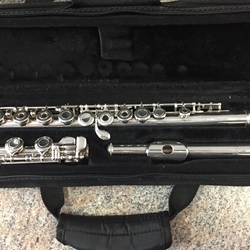 This is a Consignment Yamaha YFL-461H Open Hole Flute. It has a Silver Head and a Silver Plated Body and foot. This instrument is owned by a retired band director and has been well taken care of . It is in excellent shape!